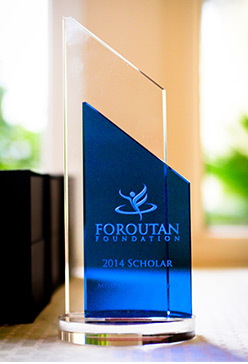 The Foroutan Foundation has established a new scholarship program, the Foroutan Scholarship, available to eligible and qualified students from California who have been admitted to an accredited university, college, or vocational school. Please see the CRITERIA page for terms and the full eligibility requirements of the Scholarship. * Adobe Acrobat Reader is required to view all PDF files on this website. This is a free program available from the Adobe website. Follow the download directions on the Adobe website to get your copy of Adobe Acrobat Reader. The maximum Award is $10,000 per year per recipient. The Award may be used for qualified tuition and related expenses as provided in Internal Revenue Code section 117(a) and the regulations thereunder. The Scholarship may be renewed each year, for a maximum of three (3) additional years (total four-year scholarship), if the Recipient continues to: 1) meet all the criteria and eligibility requirements, 2) make satisfactory progress in his or her education and training, and 3) maintain at least a 3.0 grade point average. Progress reports showing courses taken and grades received (or some other evaluation of progress if the Recipient's course of study does not lead to grades) must be provided to the Foundation at least once per academic year, and such report will be approved or otherwise verified by the college/university. The Recipient shall maintain a full-time academic schedule in each year of the Scholarship at an accredited university, college or vocational school. Applicants must be first generation immigrants to the United States (Strong preference will be given to Iranian applicants). The Applicant must be a U.S. citizen or legal resident currently residing in California. The Applicant must have a minimum of a 3.0 overall grade point average from a public high school. Applicants will be first year students in an undergraduate program or transfer students from a community college. Strong desire to complete his or her education. An online application. The Foundation only accepts Scholarship Applications submitted using this website. Personal statement that provides information about the Applicant's career goals and desire to contribute to their community. Information about unique, personal, or financial circumstances may be added. Video statement (YouTube required). Applicant will provide a YouTube link to his/her three (3) minute video clip in which the applicant expresses his or her attributes and goals. Applicant should wear professional attire in the video. Birth Certificate, Certificate of Naturalization, or proof of legal residency. Headshot (minimum of 1500 x 2100 pixels and 300 dpi). A certified high school transcript that contains the Applicant's class rank and test scores. The Applicant must have a minimum of a 3.0 grade point average from a public high school. Two (2) one-page letters of recommendation are required using the approved form. The letters of recommendation may come from either a teacher, college advisor, or a mentor associated with the Applicant's work or volunteer experiences. Letters from parents or family members will not be considered. The letters should detail the Applicant's background, achievements, leadership abilities and community involvement. Letters should contain personalized information about the Applicant. Completed Consent for Release of Information and Verification of Financial Need form (Section 1 completed by the Applicant and Section 2 completed by the college/university financial aid office). The Foundation is not accepting new scholarship applications at this time. Returning Users: You will be asked for the E-mail Address and password you entered when you first created your account using the option above. Please support us so that we can provide more scholarships to deserving students by making a tax-deductible donation today. Graduated and went back to school to receive his MBA. Graduated and started work at one of the largest on-line retail stores. Copyright © 2017. Foroutan Foundation. All rights reserved.